This is a simple project, the idea is to connect the beer lines to a small pump and themselves in such a fashion to recirculate beer line cleaner. After a short while you have clean beer lines. It’s also cheap to assemble, I’ve got less than $10 invested in this, but if you had to buy a pump, I would recommend a utility pump. 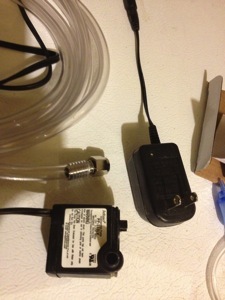 It would add a bit more to the cost, but a utility pump is useful to have. Connect the barb/flare to your 1/4 hose and connect that hose to the pump. 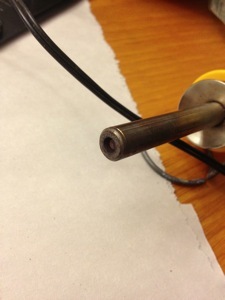 Disconnect your beer lines and your ball lock connectors. Connect the flare to the beer line, and drop the pump into a bucket of line cleaner. 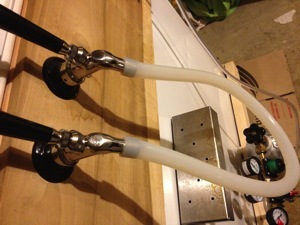 Slip the silicon tubing over your taps effectively creating a loop, open both taps. Turn on your pump and let the cleaner circulate for 15 minutes. Swap the flare from one line to the next to change the direction of the flow, and run for another 15 minutes. Keggerator project update Product Review: The original Carboy Cleaner Project update Q1 2013 Project update: Keggerator, Hops, Mashtun Fresh Poured homebrew from my keggerator.